The victim of a loan shark has revealed how he was forced to repay £90,000 on a £250 car loan – and was even forced to hand over a redundancy payoff of £8,000. During the 17-year ordeal, ‘Mike’ had his home repossessed, suffered a heart attack and tried to commit suicide. 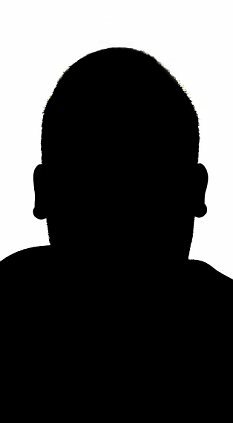 He is telling his story, anonymously, to encourage other victims of illegal lenders to have the courage to tell the police. Britain’s double-dip recession, the first since 1975, has left millions of families struggling to make ends meet. 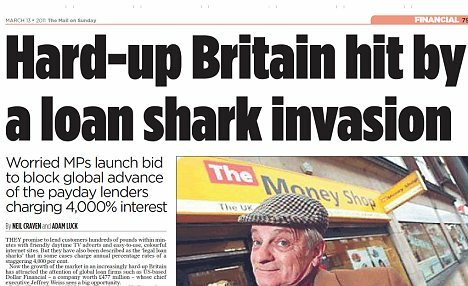 Trading Standards say loan sharks are now active in ‘every community in England’. But this ‘family friend’ soon transformed into an aggressive loan shark. Mike took on two jobs to be able to meet the payments and was ‘living on Mars bars’. ‘He started to give threats that if we didn’t pay him he would hit us or would start taking stuff out of the house,’ said Mike. The lender took the car and his children’s games console – and then acted on the threats of violence. ‘One time, I was ill on the settee and he just started laying into me in front of the kids,’ said Mike. By this time, Mike was paying a £250 a week, leaving him unable to pay the mortgage on the home he and his wife had bought. The property was repossessed and the couple were then ‘always arguing and splitting up’. Every time Mike asked, the loan shark insisted he owed him £9,000. At one stage, he took most of an £8,000 redundancy payoff – and told Mike he still owed £9,000. Mike saw in the local newspaper that another loan shark had been prosecuted and contacted the Illegal Money Lending Team, which is based at Birmingham Trading Standards, but covers the whole of England. Tony Quigley, head of the team, said that despite Mike’s lender being jailed, they were unable to recover any of his money. ‘Criminals tend to conduct a criminal lifestyle and they tend to spend all the money on themselves,’ he told Radio 4’s Today programme. Mr Quigley wants more people to be aware of the dangers of borrowing money from unregulated individuals and he wants more victims to break their silence and ask for help. The highest interest rate the team have come across is an APR of 117,000 per cent. Mike added: ‘The loan shark team gave me all the confidence [to come forward]. ‘Now we do things as a family. We go on holiday, which we haven’t done for 17 years. We went to Blackpool and took £600 with us. It wasn’t a problem. He urged those struggling with their finances to seek help from credit unions, where communities create a borrowing and saving fund with preferable rates of interest. Mike was awarded a Trading Standards Institute Hero award at the Trading Standards Institute conference in Manchester last week. The England Illegal Money Lending Team (Part of the Stop Loan Sharks project) is funded by the Department of Business, Innovation and Skills and works with local Trading Standards offices.